Centennial's wrestling team dominated the lower half of the weight ladder to race to a 57-18 dual win at Barlow on Thursday night. The Eagles benefitted from three forfeit wins in the first four bouts, along with first-round pins by Jake Angelovic at 113 pounds and Phillip Kue (138). Centennial put in barely five minutes of mat time to build a commanding 36-0 lead in the team score. The Eagles expanded their lead at 145 pounds, the first bout to go the distance, when Jonathan Tochi countered a head lock with 0:45 left and scored the clinching takedown. The move meant a four-point turnaround, which proved to be the difference in his 8-4 decision. Tochi also picked up some pivotal back points late in the second period, turning his opponent just enough to get a count at the buzzer. The upper weights proved to be more competitive with Barlow winning four of the final seven bouts. Gerrit Reasor scored a 9-4 overtime win against Centennial's T. Michael Proehl at 170 pounds in what proved to be the night's most entertaining showdown. Trailing 3-2, Reasor spent the start of the third period trying to turn his opponent for the lead. Eventually, he surrendered a point and released Proehl for an escape with 0:45 left. The two circled each other before a restart brought the two wrestlers back to the center with 0:19 on the clock. Reasor moved forward at the whistle and earned the tying takedown with a throw at the edge of the mat. "I needed to get a good shot for myself and battle my way back," Reasor said. Proehl got to his feet for what would have been the winning escape, but the final five ticks came off the clock with him unable to break Reasor's grip. Proehl shot in and got his opponent's leg early in the overtime session, but Reasor shifted his body, regained his balanced and threw himself forward toppling his opponent for the winning takedown that also came with back points. "I forced his head down, pressured into him and managed to tumble him over," Reasor said. "He's a tough kid. Overtime came down to strength and grit." The highlight match of the night came at heavyweight where Centennial's Ihe Gonzales avenged a loss to Barlow's Matt Jefferis from last year's district tournament. The two behemoths found themselves locked in a standstill in the center of the mat for a full five seconds before Gonzeles toppled the pile over for a takedown that soon turned into a pin 1:15 into the bout. "He was up too high, so I got a low base and tripped him down," Gonzales said. "I gave him a good cross face, and once I did that I knew I had him. Once you get that locked in, it's a hard thing to get out of." The Eagles won seven of the 11 contested bouts — six of them by fall. 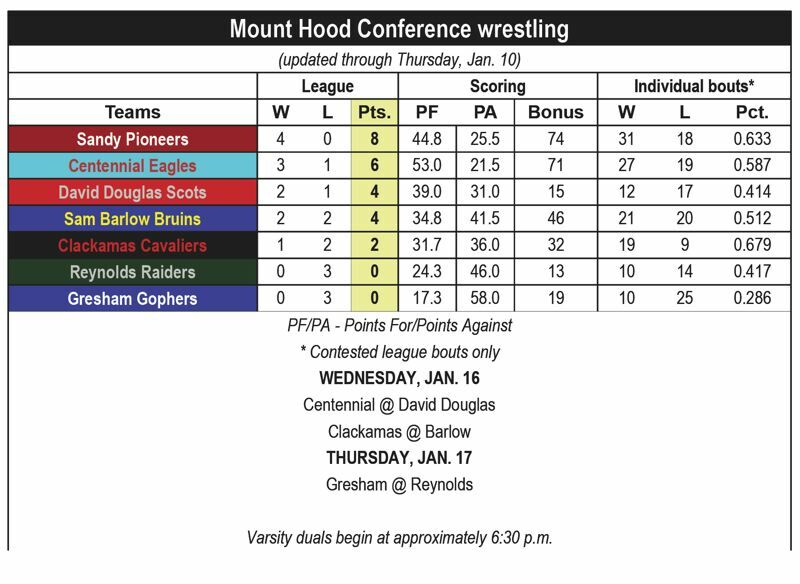 Centennial improved to 3-1 in league duals heading into Wednesday's clash at reigning Mount Hood Conference champion David Douglas. 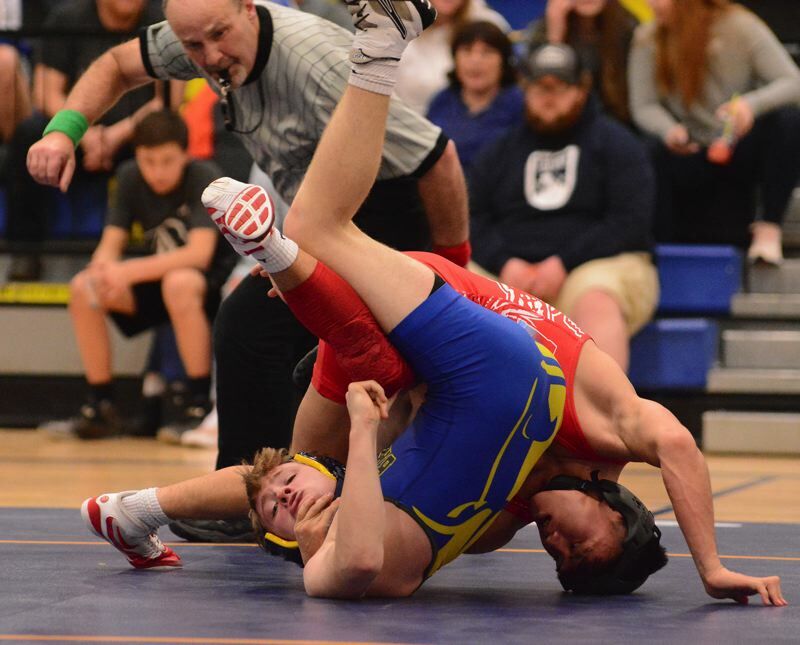 SANDY 39, REYNOLDS 25 — The Raiders got three straight wins in the middleweights with Burgess Myers (160) and Dade Kimmel (170) scoring decisions, while Joseph Mercado got a pin in 38 seconds at 182 pounds. The rally trimmed Sandy's team lead to 27-19 with three bouts to go, but Pioneers' standout Jack Rademacher scored a first-period fall at 195 pounds to secure Sandy's dual win. Sandy won six of the 11 contested bouts — five of them by first-period pins — to gain an 11-point edge in bonus points. 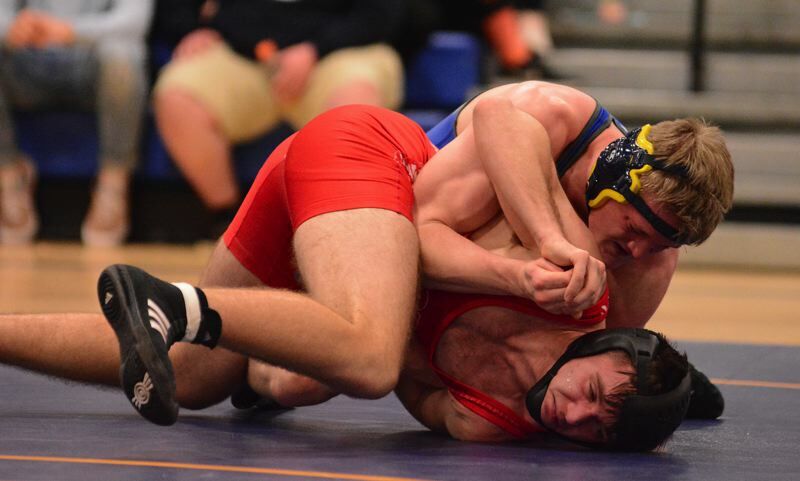 Cody Beveridge (113) gave Reynolds its only lead of the night with a 13-4 major decision in the night's opening bout. 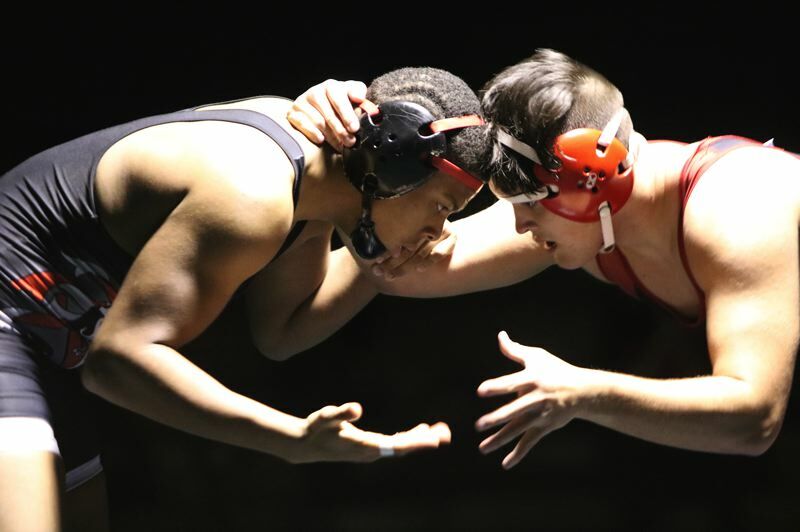 DAVID DOUGLAS 36, CLACKAMAS 26 — David Douglas 195-pound wrestler Josiah Green finally got an opportunity to avenge a loss that had been weighing on his mind for close to a year. Green edged Clackamas' Domonic Chimienti 5-3 in a rematch of last season's Mt. Hood Conference district final at 170 pounds, helping lift the Scots to a 35-26 dual win Thursday night at Clackamas High School. Green had eagerly awaited an opportunity to step back on the mat with Chimienti for the first time since last season's 170-pound district final when Green was the No. 1 seed and Chimienti won by a 14-6 major decision. This time, Green scored the initial takedown, Chimienti came back with an escape, Green got another takedown, and Chimienti got another escape with 10 seconds remaining in the first round to cut Green's lead to 4-2. Green scored an escape for the only point of the second period and took a 5-2 lead into the final two minutes. Chimienti was on the bottom to start the third round and got an escape with 1:10 remaining to make it 5-3. The match ended with both wrestlers on their feet, Chimenti unable to score a tying takedown. "That was a big match for me," Green said. "There was a lot of hype going into the match and I had a lot of energy. I just knew he was a thrower, so my thing was if I took the shots, he wouldn't have an opportunity to throw. The keys were being cautious, being patient, and keeping my mind of the target." The Scots earned three forfeits over the final four bouts. 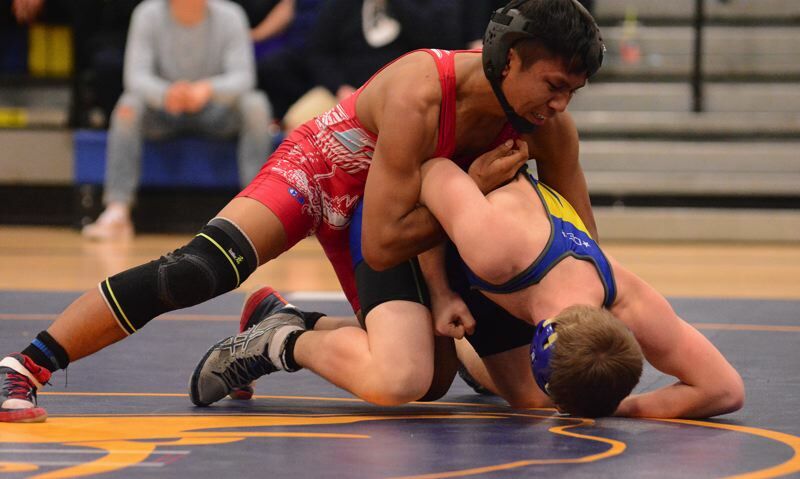 David Douglas also got a 17-2 technical fall from Damauri Crawley (126) and a 17-9 major win by Hayden Narruhn (113). Clackamas won six of the nine contested bouts.